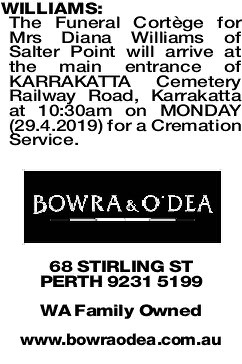 The Funeral Cortège for Mrs Diana Williams of Salter Point will arrive at the main entrance of KARRAKATTA Cemetery Railway Road, Karrakatta at 10:30am on MONDAY (29.4.2019) for a Cremation Service. 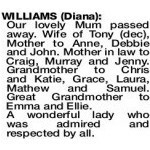 Our lovely Mum passed away. Wife of Tony (dec), Mother to Anne, Debbie and John. Mother in law to Craig, Murray and Jenny. Grandmother to Chris and Katie, Grace, Laura, Mathew and Samuel. Great Grandmother to Emma and Ellie. 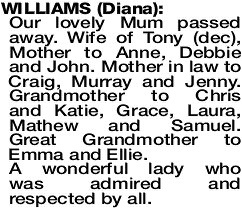 A wonderful lady who was admired and respected by all. My beautiful, wonderful Mum. A vibrant, gracious and elegant lady who was there for us whenever we needed. 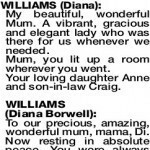 Mum, you lit up a room wherever you went. Your loving daughter Anne and son-in-law Craig. To our precious, amazing, wonderful mum, mama, Di. Now resting in absolute peace. You were always loving and kind, supportive and thoughtful, generous with your time and always thinking of others. Bless you.. and the loving legacy you leave behind. You are adored and sadly missed. Your loving daughter Debbie, son-in-law Murray and Grand-daughter Grace. Our dearest Mum and Mama. So kind, gentle, loving and incredibly selfless. You enriched all our lives and left so many happy memories. We will miss our Tuesday night family dinners. Love always, John, Jenny, Laura, Matthew and Sam. Mama, we will always remember you as an incredibly kind, generous and wonderful woman. Thank you for everything you have done for us. We will miss you always. Love Chris, Alana and Emma. Our beloved Mama, how lucky we were to have such a loving, doting and caring grandma. You played such a large part in our lives, which we cherish and will be forever grateful for. Love always Katie, Matt and Ellie. 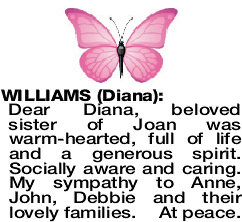 Dear Diana, beloved sister of Joan was warm-hearted, full of life and a generous spirit. Socially aware and caring. 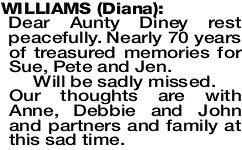 My sympathy to Anne, John, Debbie and their lovely families. At peace. 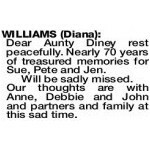 Dear Aunty Diney rest peacefully. Nearly 70 years of treasured memories for Sue, Pete and Jen. Will be sadly missed. Our thoughts are with Anne, Debbie and John and partners and family at this sad time. 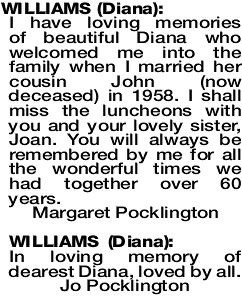 I have loving memories of beautiful Diana who welcomed me into the family when I married her cousin John (now deceased) in 1958. 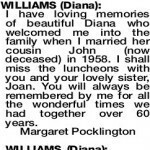 I shall miss the luncheons with you and your lovely sister, Joan. You will always be remembered by me for all the wonderful times we had together over 60 years. Cherished aunt to Antonia and Kim, loving great aunt to Claudia and Richard, and Kathryn and James. We will always remember your warm heart and endless kindness to our family. My lovely Aunt Diney. Always fun to be with. Warm memories of my time at the Davilak Street house. My sincere sympathy to Anne, John, Debbie and families. Zoe. My very special friend from the 1950s. We shared such happy times at Royal Perth Hospital as junior shorthand typists and then discovered our links to Perth College! Being a Bridesmaid at your wonderful Wedding to dear Tony was such a beautiful happy day and one I treasure.